Sue's book is compelling. Photo courtesy: Susan J Erickson. 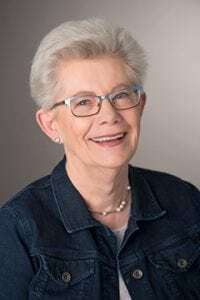 Thank you Rachel Mehl, Chair of the Sue C. Boynton Poetry Contest, for writing to WhatcomTalk to request an article about Sue. What an inspiring community maker and passion follower! As a parent, I push for the mantra, “Follow your passion and the rest will follow.” I say this to my kids but in reality it’s also for me. Sue is a true inspiration with her interest and passion for poetry. Sue grew up in a small town in Minnesota. She has a Bachelors and Masters degree in Foods and Business from the University of Minnesota. This was before the days of network cooking shows and food blogs. If she were entering the job market now, she might have been a food writer or consumer product developer. Most recently Sue pursued a career as a paralegal, as she enjoys writing and research. It was a practical career, balancing making a living with her interests and talents. 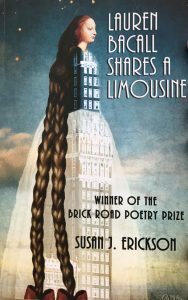 Susan J. Erickson is a gifted poet. Photo courtesy: Susan J Erickson. Sue has lived all over the United States. Her first husband was a professor at the University of Arizona and worked for the United States Forest Service taking positions in Tucson, Arizona; Ashville, North Carolina; Washington D.C.; Philadelphia, Pennsylvania; and Seattle. But “Bellingham is the most beautiful place I have ever lived,” Sues says without hesitation. She loves the Bellingham trails and often visits Fairhaven Park and Boulevard Park – both minutes from her home. While working at a big law firm in Seattle, Sue met her second husband, George through a Weekly ad. They worked across the street from one another but in the hubbub of the big city, she would have never met him otherwise. George is a retired business consultant and helped establish Excellence Northwest which provides personal development courses in Whatcom County. Upon moving to Bellingham, Sue had the goal of writing a murder mystery novel. To motivate her to write she enrolled in a poetry correspondence class at WWU. She was hooked! After retiring she continued taking poetry classes on campus. Through contacts from WWU she assisted in the Poet as Art reading series at the Lucia Douglas Gallery where local and traveling poets were invited to read their poetry. Sue provided housing for many of the traveling poets and consequently ended up with many poet friends. Through this reading series, Sue met Dr. George Drake, a now retired WWU professor. 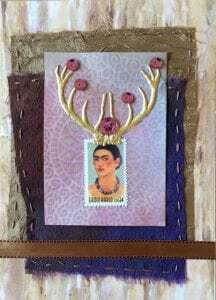 This is Sue’s Frida Kahlo collage. Photo courtesy: Susan J Erickson. Dr. Drake had the idea of an annual community poetry contest. “He’s an idea guy,” Sue tells me. She helped make the idea happen as a founding member of the Sue C. Boynton Poetry Contest. Through this, she’s gained perspective and appreciation for the art. She’s delighted that the contest had an 80-year-old and a third-grader as winners last year. It’s now in its twelfth year! The contest is free and accepts poetry in March of each year with an awards ceremony in May. The poetry is reviewed blindly by two judges and the winners are invited to attend and read their poetry aloud. The poetry is also gathered in anthologies, sold at the ceremony and available at Village Books. Art placards are created and awarded at the ceremony. Copies of these placards are also placed on WTA buses to promote the contest. Sue is amazed at how the contest has grown and the impact it has had, not only in her own life, but the community. A former winner is now pursuing a PhD in poetry. Another young contestant stated it was the most positive impact on their life so far. “The contest provides a positive outcome for the contestants,” Sue says. Sue created this collage about Janis Joplin. Photo courtesy: Susan J Erickson. Sue has immersed herself in poetry. 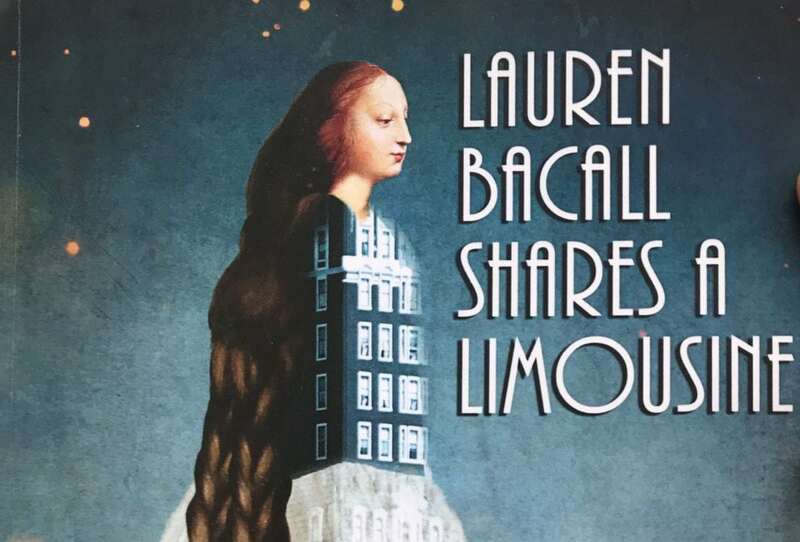 In fact, she has created enough poetry to write a book, titled Lauren Bacall Shares a Limousine. After 17 submissions her manuscript was accepted by Brick Road Poetry Press. This beats J.K. Rowling’s 12 tries! She’s sold 100s of copies since publication late last year. The book is a poetic study of women from many walks of life. Her book explores Janice Joplin’s rural “from nowhere” upbringing, her extreme talent and the fame that ensued. Sue really enjoyed reading family letters in the book by Joplin’s sister where she discussed their family, upbringing and how Janice dealt with stardom, alcohol, drug abuse and the journey toward “the wall” as Sue put it. Also explored are Frida Kahlo and Frank Lloyd Wright’s mistress, Mamah Borthwick Cheney. The latter was murdered at Wright’s home, “Taliesin,” in Wisconsin by the house cook. Many of the women in the book had complicated and beautiful relationships. All had a voice but used them in very different ways – sometimes silenced by history. Through the Boynton committee, Sue met WWU student Ellie Rogers. Together they made a book trailer of Sue’s poem about Rapunzel. Sue’s book is compelling. Photo courtesy: Susan J Erickson. What draws Sue to poetry? “Creating words that were not there or together before,” she answers. Sue goes on to describe a world that is full of creativity which is accentuated by access to social media. “It’s another way to get your work out there,” she contends. It does not end there. 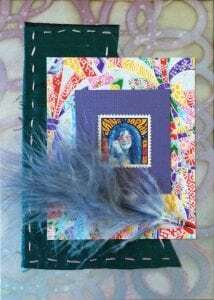 With no former drawing or painting experience other than a passion for it, Sue pursued the art of collage bringing together old photographs and postage stamps, fabric, paint and pen to help find meaning from unrelated things. She’s made 150 different collages using postage stamps of women in her book and provides a free copy with each book sale at readings. Like the great artists of the impressionistic age, Sue has built a community to expand, improve and spread her art. What an inspiration to those of us in retirement and those thinking about the future. If poetry interests you, I encourage you to enter the Sue C. Boynton Poetry Contest and see where it may take you.